LEXINGTON, Ky. (April 20, 2018) — Two University of Kentucky faculty members were honored for their outstanding contributions to teaching and scholarship at the 2018 Provost Awards ceremony held April 19. Keh-Fei Liu, professor of physics and astronomy, was presented the 2018 Albert D. and Elizabeth H. Kirwan Memorial Prize, given each year to a faculty member in recognition of outstanding contributions to original research or scholarship, with an emphasis on work produced four years prior to the award. Dibakar Bhattacharyya, professor of chemical and materials engineering, was presented the 2018 Sturgill Award, given each year to a graduate faculty member who has provided outstanding contributions to graduate education at UK. 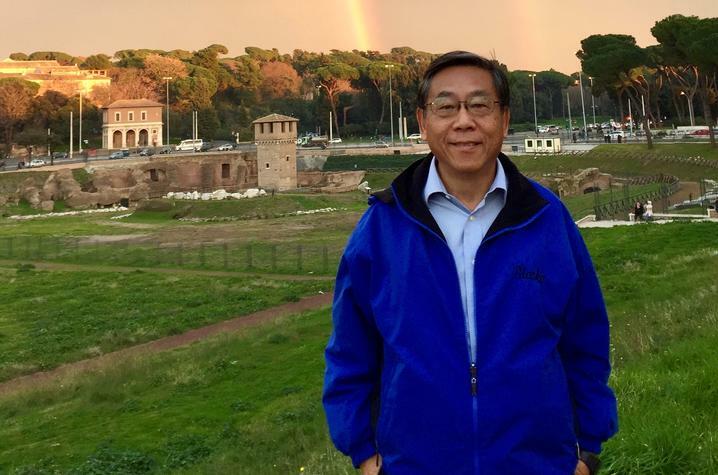 In his 37 years at UK, Liu has successfully built an internationally recognized research program in modern nuclear and particle physics. He is regarded as one of the most distinguished scientists at the university. His research has helped to shape the field of computational particle physics. Liu recently published two landmark results, one of which was chosen by the American Physical Society as one of eight research highlights of the year in all of physics. "I first learned about him in 1994, when my postdoctoral supervisors at Cornell ran into my office with the news of a job opening at UK. They described Liu with great admiration. He was held in the highest regard by his colleagues around the world back then, and his reputation has only continued to grow," wrote Alfred Shapere, department chair of physics and astronomy, in a nomination letter. Sherali Zeadally, College of Communication and Information, Information Communication Technology. The Kirwan Memorial Prize recognizes its namesakes' collaborative research efforts, as well as Albert Kirwan's endeavors in creating an environment at UK that promotes high quality research and scholarship. Head football coach from 1938 to 1944 and later dean of men, "Ab" Kirwan was a distinguished faculty member and scholar in the field of Southern history, dean of The Graduate School and served as UK president from 1968 to 1970. Elizabeth Kirwan was awarded the Sullivan Medallion in 1973 for her service to UK and the Lexington community. She held executive roles in more than 10 organizations, including president of the UK Woman’s Club and chairwoman of the Lexington Parks and Recreation Board. Professor Bhattacharyya is celebrating his 50th anniversary at UK. He is an internationally known leader in the field of membrane science, having published 185 archival papers, 35 book chapters and 9 patents. "As Dr. Bhattacharyya enters his sixth decade of service at UK, he continues to maintain a remarkably productive research agenda," Doug Kalika, professor and chair of Department of Chemical and Materials Engineering, notes in his nomination letter. 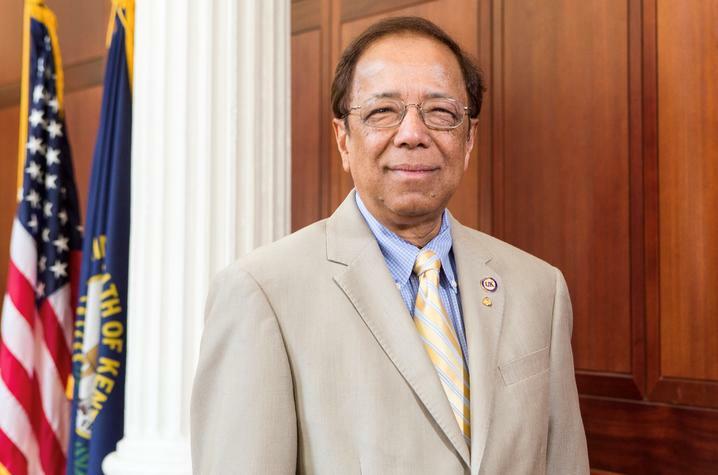 "Dr. Bhattacharyya has had an enormous impact on the lives of the many undergraduate and graduate students who he has taught, mentored and inspired." Thomas Widiger, College of Arts and Sciences, Department of Psychology. The Sturgill Award is named in honor of William B. Sturgill, who contributed to higher education through organizing and serving as president of the Hazard Independent College Foundation, in addition to working with legislators to develop the community college system in the Commonwealth. Sturgill, who died in 2014, was born in Lackey, Kentucky, and graduated from UK in 1946. He was involved in a variety of businesses, including executive and owner of several coal operations, East Kentucky Investment Company, Fourth Street and Gentry Tobacco Warehouses and the Hartland Development Project. Sturgill served as both secretary of energy and secretary of agriculture under Gov. John Y. Brown Jr. He served 18 years on UK's Board of Trustees, including serving as chair for 10 years. The Sturgill Development Building is named in his honor.